The MTC's Operations Committee will be meeting on Friday, March 11th at 9:45AM (see agenda). I usually refer to the Operations Committee as the defacto Clipper Card board because they are the ones who review and approve funding proposals, and gets the latest information about what's going on with the Clipper card. VTA has accepted Clipper cards since February 16th. The two customer service centers at Embarcadero station and Bay Crossings booth at the Ferry Building is open for business. Caltrain ended 8-ride tickets in February and monthly passes starting with the March pass. BART is spending the month of march activating their ticketing machines to also be able to add Clipper e-cash. All stations are to be ready by the end of March. Golden Gate Ferry begun installing their new self-service ticketing machines, but one of the unions for Golden Gate Ferry employees filed a complaint with the federal government about the loss of jobs. Muni will be transitioning the "M" pass to Clipper only and starts with the April pass. A "change order" of $450,000 for additional Customer Service center support. The complaints about Caltrain are overwhelming the telephone lines that they need additional people to take-on the help. An amended "change order" of $750,000 for Clipper "implementation, and design improvements, enhancements, and materials." They grossly underestimated how much was needed to properly fund Clipper's needs. Caltrain has been taking a serious toll on Clipper and their customer service areas, and the reason is for the extremely complex system that has to be used. Statistically, Caltrain is only 2% of Clipper's transaction volume, but more than half of the phone calls to the customer service center is about Caltrain problems. Refunds are being processed on a modified process where calling a customer service center and successfully appealing the issue will result in the agent authorizing a refund on the spot. This is only temporary and will at least last until April 1st. The normal procedure for a refund can take up to three weeks, if approved. Clipper's customer service office has hired ten more people to answer calls for the next three months. MTC and Clipper are spending more on customer education with outreach events, additional banners, labels, stickers and signage, sending e-mails, and modifying the telephone menu to provide Caltrain passengers tips on using the card. MTC consultants have been riding the trains and observing customers at platforms to find out what problems they are facing. 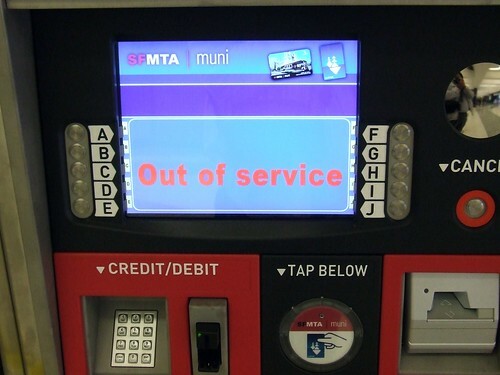 Lastly, MTC is looking into the possibility of replacing some of the Caltrain ticketing machines with Clipper self-service add value machines so people can purchase their media at the station. In another topic, a citizen complained to the Operations Committee about having no resolution for disabled passengers' authorized attendants being unable to utilize Clipper. This creates a challenge for the MTC and Clipper because there is no set policy on what should be done on how an attendant can receive the discount fare benefit when accompanying the disabled passenger. For buses and light rail, attendants pay cash fare (not Clipper e-cash). For BART, passengers will still use the red discount tickets. The attendant gets their own RTC discount card. Attendant rides free of charge when accompanied by the disabled passenger. The disabled passenger is issued two RTC cards, the second card goes to the attendant. Just today, Clipper announced the Glen Park station's ticketing machines are now able to add Clipper value. The other station that can also add value is at the new West Dublin/Pleasanton station. Let's hope all the stations will be ready by the end of the month. While I understand the Caltrain system on Clipper is quite complex with a zoning system, 8-rides, monthly passes, minimum balances, and the need to deduct the maximum fare, it really is becoming a big problem. With all the problems, the MTC has to spend more money to get it all fixed and cleaned-up. Who takes the blame for all these Caltrain issues: MTC/Clipper for setting-up complex policies and no automated add value machines at stations, Caltrain for such a complex fare system, or the passengers for not educating themselves by reading the brochures and noticing the signage near every train door talking about tagging-off? I don't ride Caltrain on a regular basis, but I know how to use my Clipper card correctly and follow the instructions because I educated myself by reading the brochures and paying attention to the signage telling me what to do. I know that hundreds of people have been reading my blog's article about using Clipper correctly, but I'm not sure how many actually read it thoroughly and followed the steps I told you about. With all honesty, passengers are to blame when they mess-up and not follow the steps they are told to do, and it's not that complicated when you understand the reasons why certain rules needs to be followed. Clipper is to blame if there's a technical glitch, or if the card readers are broken or placed in poor locations. I'm hoping Clipper will install some add value machines at Caltrain stations (or at least major stations). While the card only accounts for 2% of the overall transactions for Clipper, Walgreens is becoming a popular place to get pain meds and Caltrain passes because you are standing on your feet for a long time in line at the photo counter to add Clipper value. That's all for now, have a great weekend. Akit - The Clipper-Caltrain problems aren't because riders are inept and can't understand simple instructions. The problem is that Clipper-Caltrain created an entirely new way to mess up (i.e. forgetting to tag off) that never existed before. And if you make that mistake then the penalties are high. It is as if someone in public works decided to remove all of the manhole covers. Surely people are smart enough not to walk into an open manhole, right ? And usually people will avoid that peril. But once and a while someone slips up and falls in. It isn't fair to blame the victim. It doesn't need to be that way. The base Clipper card technology can support predetermination of destination, a feature that we take for granted in the thousands of traditional paper ticket systems. This "destination selection" mode of use can coexist with the current tag on/off mode. So long as Caltrain stations lack controlled access gates like BART people will occasionally forget to tag off. Clipper-Caltrain needs to address the root cause of the problem instead of papering it over with more customer service and outreach. When you've got a leaky water pipe, you fix the leak. You don't invest in mops and janitors forever. I have a fear that Caltrain may "fix" the "spurious ticket to Gilroy" problem by simply discontinuing service to Gilroy. That won't affect me but it will cause hundreds of south county Caltrain riders to take to the road instead. Funny comment about Walgreens being a convenient place to pick up pain meds. You made me laugh after spending on average about half an hour each time to reload Clipper there. Fortunately there's good news on the horizon : ClipperDirect allows employees using pre-tax funds to be their own Walgreens via the web. Tagging-off is the only way for Caltrain to properly charge fares. For a barrier-free system, how are they supposed to make sure people are paying the proper fare? Two agencies that comes to mind is London's Overground service where they also do a tag-on and off procedure, otherwise failure to tag-off is a "penalty fare" equivalent to the maximum fare. Seattle's ORCA card does this too with their commuter rail service, and so does other mileage/zone based services that rely on RFID cards. What makes it so odd is Golden Gate Transit has been doing this procedure for years (tag-on is max fare, tag-off is proper refund) and I don't hear complaints about it. If it works for GGT, why not Caltrain? Tagging off is hardly the only way that Caltrain can charge the correct fare. If Clipper supported predetermination of destination at tag-on time that would work just fine too. In that mode the user would preselect a fare product and only that fare product would be valid. For example a user could preselect a SF to Redwood City ride. When the conductor inspects the Clipper card it will report "Fare good from SF to Redwood". So long as the rider is between those two stations then all is OK. I'm somewhat familiar with London's Oyster system. Though I haven't used the card I recall controlled access both at rail stations and buses, something that Caltrain does not have. I can't comment on Seattle's system though. thielges: Wouldn't having people stand at a machine to pick their destination when they tag on just cause a long line of customers at the card readers? Golden Gate Transit's tag off procedure is more intuitive because they have Clipper readers at the exit doors of the buses. Caltrain should just simply things and require riders to tag once by replacing the current Clipper readers with a push-button version that allows for selection of the destination zone. Problem solved! See photo of such a reader. P.S. - Implementing a tag once procedure for Caltrain would also eliminate the requirement for 8-ride and monthly riders to load the $1.25 minimum to their cards. Another problem solved! A simpler albeit more expensive solution would be to just add enough Clipper terminals so that lines don't become too long. There are other ways to mitigate the Clipper terminal bottleneck though probably too much detail for here. It looks like there is a bug in the Clipper system that nobody wants to acknowledge or resolve. I ride Caltrain from Gilroy to Sunnyvale on a regular basis so I have an autoload 8 ride pass. About once every 2 weeks I ride from Gilroy to San Francisco so I purchased an autoload cash of $50. When I attempt to tag off in San Francisco I get an error stating Invalid travel. It takes 4 hours for the system to recognize the completion of my travel and charge me the full fare so that I can use my card again. In the meantime, my card is useless. I cannot ride the bus in San Francisco and use my cash. Clipper Customer service has basically told me "sorry but there's nothing we can do". Stranded in San Francisco with no way home! But what I don't see is why we have to then tag on and off on one of our trips to activate the monthly pass. It seems that it would be much simpler just to tag on and then immediately cancel the trip AT THE SAME STATION. Then there's no risk of the evil $12.50 charge to a monthly passholder. Has anyone tried this? The fact that neither of these options are available (or at least advertised in the first case) is why I do agree with a lot of commenters that the system is set up so that if we /do/ make a small mistake that we have to pay a lot of money for it with no recourse. The more complicated you make a system, the more likely that people will make mistakes, and you have to admit this monthly pass business is kind of a complicated situation. (If there are 10,000 monthly pass holders, at least a few of them are going to make a mistake once in a while...we're not perfect). You've got the three points down correctly. There's a lot of problems with the fare structure of Caltrain and how it plays a role with the proper usage and limitations of the Clipper system. Hopefully there will be a much simpler way to run the program for Caltrain. Never tried tagging on and off at the same spot, nor heard anyone ever attempt it.